2015 VetShopAustralia Surfing Dog Spectacular. She is a seven time world champion surfer. And on Wednesday, Layne Beachley showed off her skills on the waves in a whole new way. 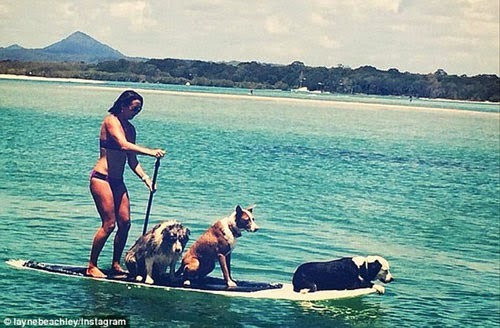 Paddle boarding at the beach in Noosa, the 42-year-old athlete was joined on the long board by her three dogs. The wet canines sat comfortably on the board while Layne paddled along the water. 'Noosa has gone to the dogs!,' she captioned the Instagram post, along with hash tags referencing the surfing competition held in the town next year. She is currently in the Sunshine Coast filming a documentary for the event. The Noosa Festival Of Surfing is an eight day extravaganza held in March, that will feature professional competitions, live music and family challenges. Ironically, the same activity that Layne shared on social media will be an actual competition during the festival. The VetShop Australia Surfing Dogs Workshop will see surfers take to the waves with man's best friend sitting comfortably at the front. The annual festival will run between March 7-15 next year. #2015 VetShopAustralia Surfing Dog Spectacular.